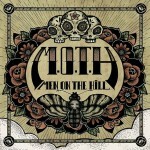 Share the post "Album review: MEN ON THE HILL – M.O.T.H." Imagine living in a post-apocalyptic, musical wasteland populated by pretentious jazz-loving “intellectuals” who get out of the bath to take a piss, adore Snorah Jones and listen to a hoaky amateurish local English-language radio station that only plays songs which are out of copyright because they’re free to use….welcome to my world on the French Riviera. I don’t mean to sound ungrateful but this is the land which rock music forgot, left behind like an allotment in Chernobyl. But wait….what’s that emerging through the nuclear fog, drifting across the torched rose wine vineyards, like an oasis of hope, a Mad Max come to save humanity and rock us back to life ? There are three Men On The Hill, a holy trinity of saviours, holding the earth’s last remaining copy of Deep Purple’s Machinehead, here to redeem our mortal souls from endless musical masturbation – JAZZ, an eternal hell where the only one getting anything out of it is the person playing it. Franco-Italian power trio Men On The Hill have been plying their trade locally for years as a damn good classic rock covers band, becoming habitual support for such visiting luminaries as ZZ Top, Deep Purple (Paice drummed with them on their version of “Highway Star”), Status Quo and many others. M.O.T.H. have finally broken out and put together their debut album of very impressive self-penned rockers. It’s common knowledge that everyone in a trio has to put in a shift and these guys work harder than a hungry reindeer at Christmas. Fabrizio Morabito (guitars and vocals), Julien Orschek (drums) and Simone Nasello (bass and vocals) know exactly what they are doing – what you’d call “a proper band”. Driven hard by drummer Orschek, the energizer bunny who combines the enthusiasm of Animal from The Muppets with the deft “drums-as-solo instrument” artistry of Keith Moon, M.O.T.H. punches hard right from the off with catchy-as-the-clap “Mexican Skulls” and it’s all rip and no dip from then on. Almost Rush-like on the intro to “Gypsy Moth Blues”, this one morphs into a real rocker whilst “Dark Spell” recalls Australia’s Jet in thrust and structure. Reasonable comparisons will abound with the Foo Fighters and QOTSA but there is a commercial appeal to M.O.T.H. which comes from bucket-loads of experience hanging out and supporting classic rock’s finest. “We Are Energy” tips the hat from afar to Nirvana whilst “Coming To You” smacks of a dumbed down Schenker riff (when he’s not twiddling at lightning speed). There really is something here for everyone with “Going To The Borderline” channelling pyscho-punk and Billy Idol attitude to great effect. If there’s a single, its “Crazy Daisy” where Orschek once again fills and solos like a dervish around Nasello’s thumping bass line. Morabito is rockstar epitomized throughout with exemplary riffage, thoughtful breaks and timely non-gratuitous soloing. This entry was posted in ALBUM REVIEWS, ALBUM REVIEWS (Mobile), All Posts and tagged album, classic rock, Deep Purple, hard rock, Ian Paice, Men On The Hill, review, rock. Bookmark the permalink.